You notice that your delegated rules (or favorites) display links to two or more rules listed by the exact same name. For example, the screenshot below from the Manager portal of a PRPC 6.2 SP2 system shows two rules named Example Report. The Delegated Rules area of PRPC’s Manager portal displays links to rules listed by the exact same name when rules are delegated with the same Anchor Text. The links to delegated rules are stored as System-User-MyRules instances, which can be easily updated. Open the System-User-MyRules instance that you want to edit. You can then either modify the Anchor Text as desired or remove any unneeded entries. The System-User-MyRules is considered a data class, so making changes directly to this instance must be made in each environment where you experience the issue. Alternatively, create a new product rule by selecting Product from the SysAdmin category, then move your changes to the other systems as needed. Below is an example based on a PRPC 6.2 SP2 system; however, you can refer to the Help system for your version of PRPC for additional guidance. 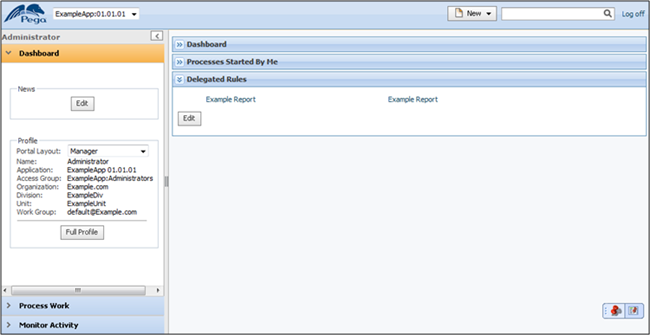 The screenshot below shows two rules named Example Report. In this example, the Anchor Text for the list view was changed to Example Report List View. The new Anchor Text Example Report List View is now displayed on the Manager portal, which enables you to easily distinguish between the two rules.